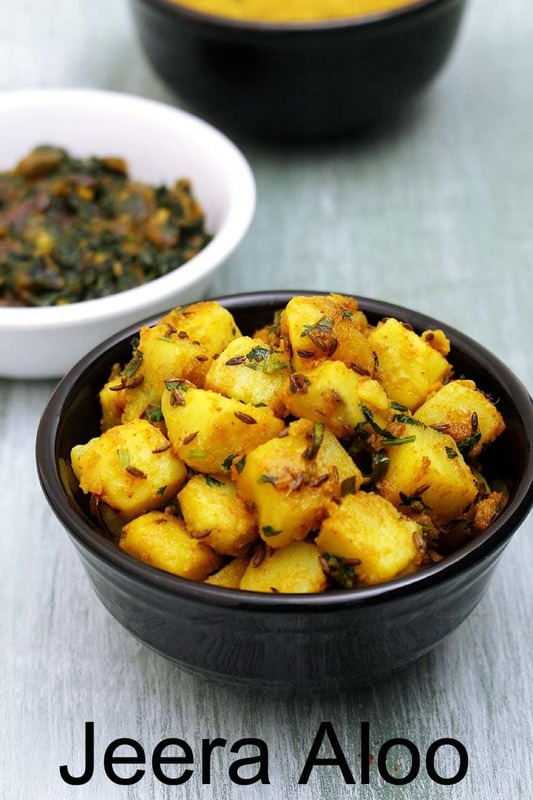 Jeera Aloo Recipe – This is home style, delicious and quick to make dry aloo sabji recipe. This goes very well with phulka roti, poori or paratha. When you do not have any vegetables in your fridge, make this simple jeera aloo. It also gets ready very quickly. Yes it takes less than 10 minutes (if boiled potatoes are ready). As the dish name says, there are two main ingredients – Potatoes and Cumin seeds. It is lightly spiced with basic Indian spices. 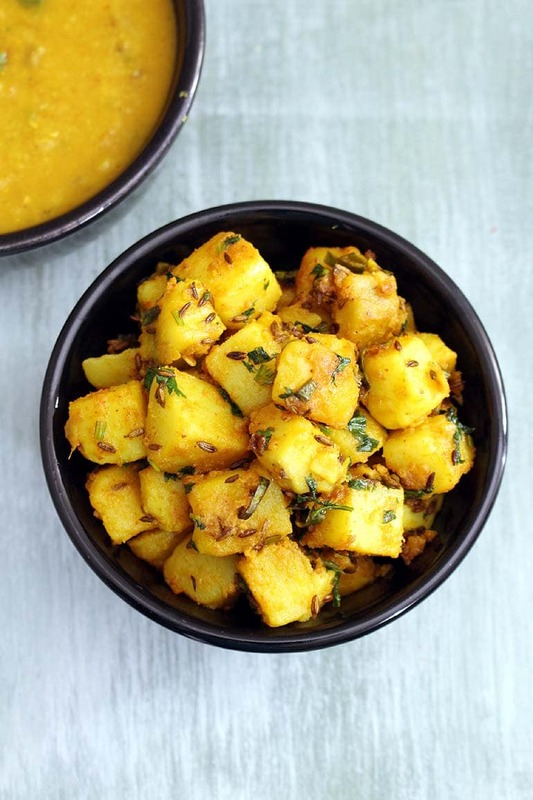 This is Vegan and Gluten Free aloo sabji recipe. Be careful while boiling the potatoes. They should be just soft (not overcooked where they become crumbly or mushy). 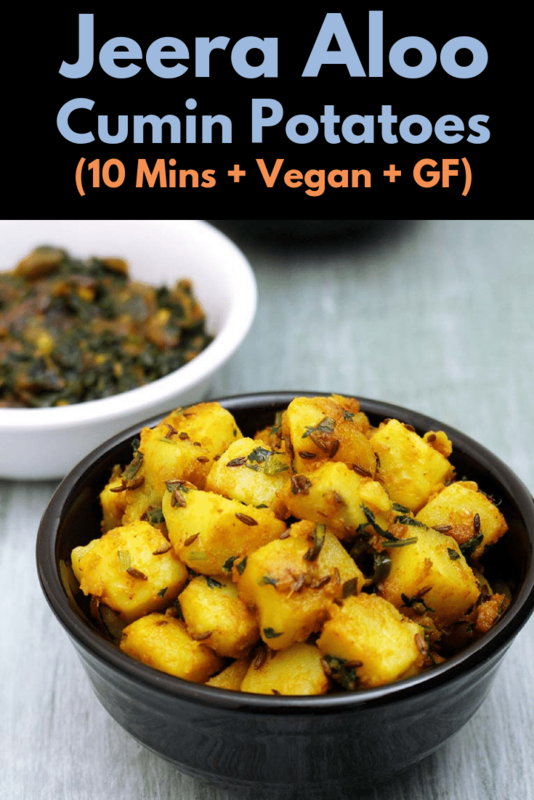 If you are in India then you are good to go (you get the right variety of potatoes). Everyone else, please do not use Idaho or Russet potatoes. They do not hold shape once boiled rather they get crumbly and dry. You can use gold, white or red potatoes. To get the clean cut and nice cubes of potatoes, always let the boiled potatoes cool down completely and then chop. If chopped / cubed while they are piping hot, they will sure break and become crumbly. Sauteing the cumin seeds till they are brown in color is MUST. otherwise you will not get good cumin flavor. As the cumin seeds fry in the oil, they give the strong aroma. This is what we are looking for. Sometime while cooking the potatoes they might stick to the bottom of the pan. If this happens sprinkle a little water and continue. 1) Boil the potatoes in instant pot or stove top pressure cooker. Let it cool down and then peel the skin. 2) Cube them into small pieces. 4) Saute till they are brown in color and you will get nice aroma of cumin. 5) Add green chilies and ginger. 6) Mix and saute for a minute or till the raw smell of ginger goes away. 7) Add turmeric powder and immediately mix. 8) Add cubed potatoes, salt, red chili powder and coriander powder. 9) Mix very well so all the masala and oil is coated to the potatoes. Cook for 1-2 minutes or till the potatoes get hot. If it is sticking to the pan then add a splash of water and continue cooking. 10) Now add lemon juice and mix. Turn off the stove. 11) Lastly sprinkle chopped coriander leaves. 12) Mix well and it is ready to serve. Serving suggestion: Serve jeera aloo with roti, puri or paratha. It can be served on side with your dal-rice. Boil the potatoes till soft yet firm. Once cooled, peel them and cut into cubes. Heat the oil in a pan on medium heat. Once hot add cumin seeds and saute till they are browned. Mix in green chilies and ginger, cook for a minute. Add turmeric powder and mix quickly. Immediately add potatoes, salt, red chili powder and coriander powder. Mix and cook for 2 minutes. If needed add splash of water.